Dr. Rice has been practicing veterinary medicine since 2006 at Issaquah Veterinary hospital and bought the practice from Dr. Shuttleworth in 2011. After previously working at Wilderness Animal Hospital with both Dr. Zimbelman and Dr. Carroll, she moved here to have more freedom to practice naturopathic medicine. She treats her dog Neptune, an 8 year old Aussie mix as a member of her family, and she really loves that our clients do the same. The Ohio State University is where she recieved her undergraduate and veterinary medical school degrees in 1992, and though she initially wanted to work with farm animals as well as cats and dogs, she realized that the hours that horses keep for veterinary calls were a little too much for her. 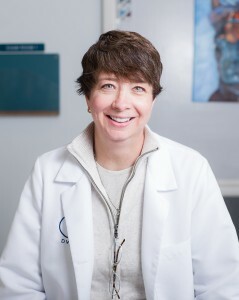 Unlike some, Dr. Rice had already decided by the time she was just 9 years old that she wanted to be a vet; animals seemed to gravitate to her and she was able to make connections with them but she also wanted to work in a service related field, and this seems to be the perfect fusion of helping animals and people for her. Ultimately, it is most rewarding for her to see the cats and dogs that have gone through all types of treatments in Western medicine and end up improving greatly with Eastern medicine treatments. Like all veterinarians out there, she’s seen some odd cases, but one that stands out to her would be the ingestion of a Christmas tree shaped ornament, that displayed prominently on the patients x-rays. Dr. Rice practices holistic veterinary medicine, supplementing her modern training with ancient Chinese herbal supplements, acupuncture and k-laser therapy to create a more well-rounded approach to your pets health. We have a separate, quiet room for acupuncture and laser therapies to create a calm environment for your pet so they may receive the full benefit of the treatment. Acupuncture and laser treatments have been very helpful for a number of our client’s pets, to treat and help cope with ailments ranging from arthritis and soreness from broken bones and surgeries to speeding up the healing time of wounds and relieving symptoms of long-term illness.